Fleet Pond is the largest fresh water lake in Hampshire and the nature reserve has 54.6 hectares (135 acres) of varied habitats for the enjoyment of the local community. The pond itself occupies about half this area. The picturesque 21.4 hectare (53 acre) water was recorded in Saxon times as “Fugelmere” and supplied fish to the monks of St. Swithins (now the Cathedral) at Winchester. Unfortunately in the past 25 years Fleet Pond has become very shallow due to large amounts of sand silting it up, with a depth of only 16″ right across the pond. Fishing and boating is allowed during the period between 16th June to 14th March. Fishing is only from 6 swims (namely, particularly good places for fishing) along the railway bank and one at the bottom of Chessnut Grove Rd. All the platforms have recently been given a facelift and provide improved comfort thanks to the Fleet Pond Ranger!. Typical fish stocks are: perch and hybrids up to 2lbs, tench up to 4lbs, bream up to 5lbs, carp up to 10lbs, roach and rudd up to 11.5 lbs and pike up to 18 lbs. Picture: Common Carp, credit here. 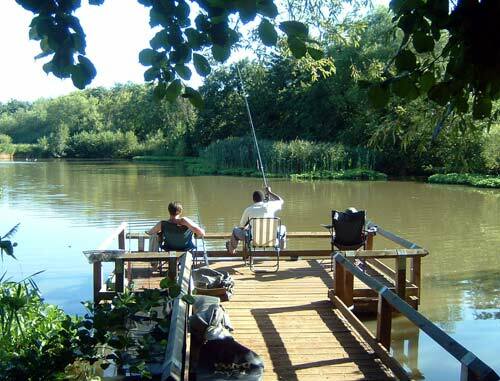 To fish at Fleet Pond a permit from Hart District Council is required. These are available from the reception desk in The Harlington Centre, or ‘Tackle Up’ on Fleet Road. Also required is an Environment Agency rod licence which is available from the Post Office or the Environment Agency website. Fishing is only from a boat or an approved fishing jetty, site by-laws apply. The top picture is taken from an article in The Independent in March 2008, which includes the interesting statement that “If your home is where Hart is – well, lucky you. It is a tranquil corner of Hampshire where the statistics suggest that the quality of life is higher than anywhere else in the country”. This entry was posted on Tuesday, October 21st, 2008 at 2:13 pm and is filed under Plants and Animals. You can follow any responses to this entry through the RSS 2.0 feed. You can leave a response, or trackback from your own site. LOVE this photograph from the Independent! It must be a pretty special experience to sit where others have for hundreds of years and enjoy the peaceful surrounds on a sunny day – every hopeful of a bite on the line! Roach and rudd up to 11.5 lbs Wow Thats amasing! Has someone been dumping nuclear waste in the pond or perhaps steroids?? Id love to see a photo of one of these critters. Ok maybe a typo but I thought it was funny! only 4 “fishing” platforms are in good order along the railway bank, 1 is in dis-repair and the “6th” platform was fenced off in 2007 due to poor condition and disappeared completely in 2008! The two previously dilapidated “jetties” have now been re-built to a high standard particularly by the rebuilt bridge on the railway bank – well done. Hope the silt issue is attended to in the very near future (not to mention the Canadian geese! ).